this column was a recommendation—no, a requirement—to read The Train to Crystal City, Lifetime Learning’s read of the year. That is a story of how we can mistreat some of our citizens in times of panic over war. Here, then, is a prescription for easing the pain inflicted by reading that book. The antidote is to read Larry Smith’s book Trouble. The book’s title aptly describes the travails of my neighbor, Robert “Bob” Sweatt. The title, however, is the nickname of the B-24 Liberator bomber that carried Bob on a mission over Ludwigshafen, Germany, on January 7, 1944. The cover has a photo of the bomber’s fuselage with its name and a picture of the iconic WWII lass with the windblown skirt. Bob was the only survivor of the 11 member crew on that mission. Initially, he was saved by mud and cow manure. 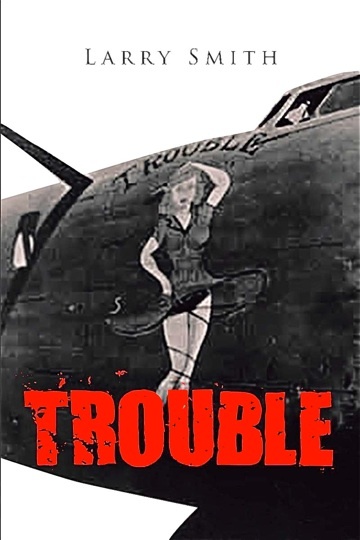 The author is Bob’s son-in-law, so Trouble is in part an autobiography. Once you read the first sentence of Chapter 1,— “This story is true, but almost unbelievable.” —this is a book that you will not be able to put down. The latter part dealing with the mission that left England one morning 74 years ago is more suspenseful than any murder mystery. As you read it, see if you can conclude how I, an old military veteran, can think that it should be used as a text for emphasizing the absolute requirement for discipline and obedience of orders in the military. Ninety-five year old Bob Sweatt now lives in an assisted living facility in Bryan/College Station. He can recall and discuss his crew mates and the French men, women, and children who provided him safety and cover, even through personal contact with German soldiers. As you read Trouble, think about not knowing your neighbor. I have known Bob for almost 40 years and knew a bit about his weeks in France. I was even privileged to shake the hands of several of his French saviors who visited him a few years ago. This book, however, established that I really did not know my neighbor. I knew and respected Bob’s character, but I did not know the facts that shaped that character. The same is true of another neighbor, the late Clem Kathman. 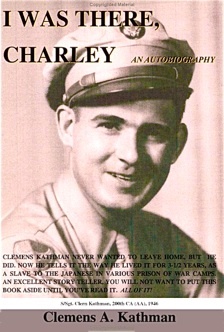 Clem’s life changing years are also recorded in a book, his autobiography, I Was There, Charley. Here he details his survival of the Bataan Death March and over three years as a prisoner of war in Japan. As you read these two gripping accounts of surviving under unbelievable conditions, you will have to nod your head in agreement with their designation as members of the Greatest Generation. Confirm that designation by multiplying Bob and Clem by 13 million. That is the number of American men and women who put on the military uniforms of their country in the 1940s. Fortunately, many of them did not face the challenges of Bob and Clem. That was just their good fortune, because each of them was in a situation that could have placed him under heavy fire or in the hands of brutal enemies. This is not to denigrate the brave men and women who faced our enemies in Korea, Vietnam, Afghanistan, Iraq and many other places around the world. They, too, are in dangerous places on a frequent basis, but Bob’s and Clem’s survival under extreme conditions and their willingness to share their stories deserve special attention and credit. 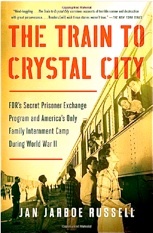 Even if you find history boring, Trouble, I Was There, Charley, and The Train to Crystal City should be laying side by side on your reading table. Don’t let them just lie there. Pick one up, open to page 1, and start reading, Each page will keep you more mesmerized than anything on TV. Then make sure that your children of all ages pick up the books to read as soon as you close the back cover of each. But be careful. You may become history addicts.